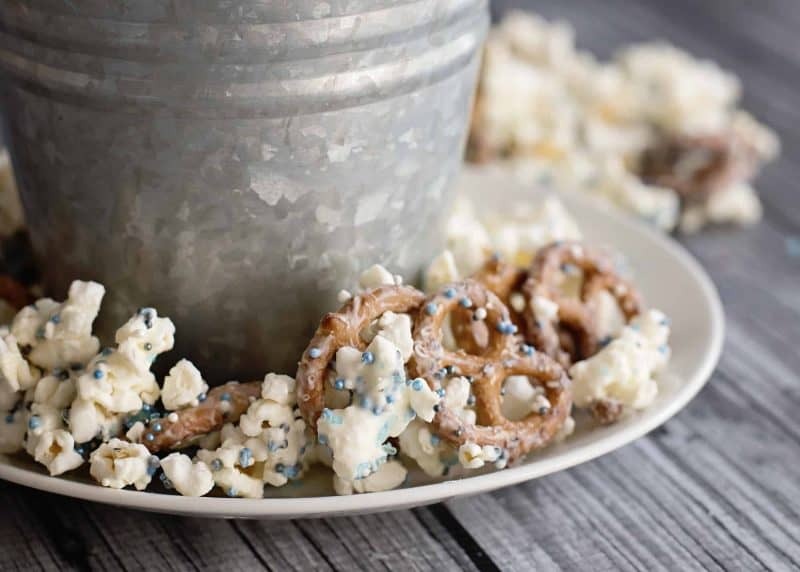 Microwave popcorn makes this candy coated Holiday Popcorn Crunch quick and easy! 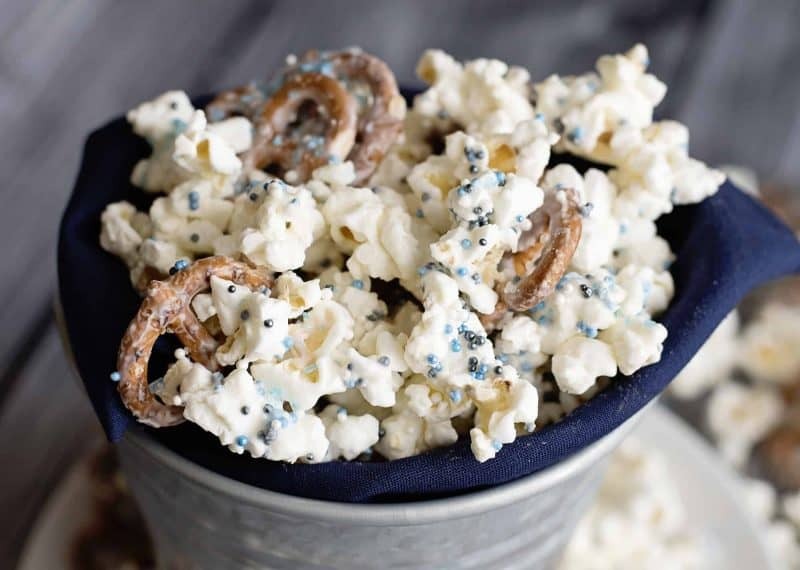 This delicious candy coated holiday popcorn crunch begins with microwave popcorn, which means it’s quick and easy to make. It’s a fun treat to make when you want to do something special with a little window of time. Perfect for kids to do on their own, for grandparents to make with grandkids, or you can make it on a larger scale and to give away as treats. I hope you had a wonderful Thanksgiving. We were able to get together with a great deal of our extended family, enjoy one another’s company, and eat some awfully good food. We didn’t do a whole lot other than sit around, drink coffee, and talk, but that was the goal all along – reconnecting. Too often I think we get distracted with the trappings of the holiday that we miss out entirely on the purpose of the holiday itself. That is one thing we are trying to do – stop talking about supposed meaning of these special days and actually make them special, put our actions where our intent is so to speak. We really set this into motion in a big way last year around this time and cut out a lot of the noise surrounding this time of year to bring the focus in on family, blessings, and gratitude. We ended up having the least amount of decorations and busy-ness that we’ve ever had and the most meaningful, joyful, and fulfilling season we’d ever had. So this year we are going even further with that concept. We have made some neat plans to implement this and I will probably share some of them in my emails and such so subscribe if you’d like to follow along a bit. 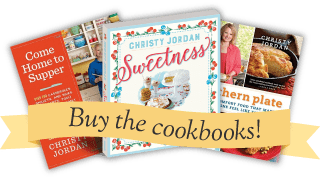 Of course, some of my most precious memories are of time in the kitchen and the gifts of time together are truly some of the most treasured, so I have lots of great recipes coming your way! 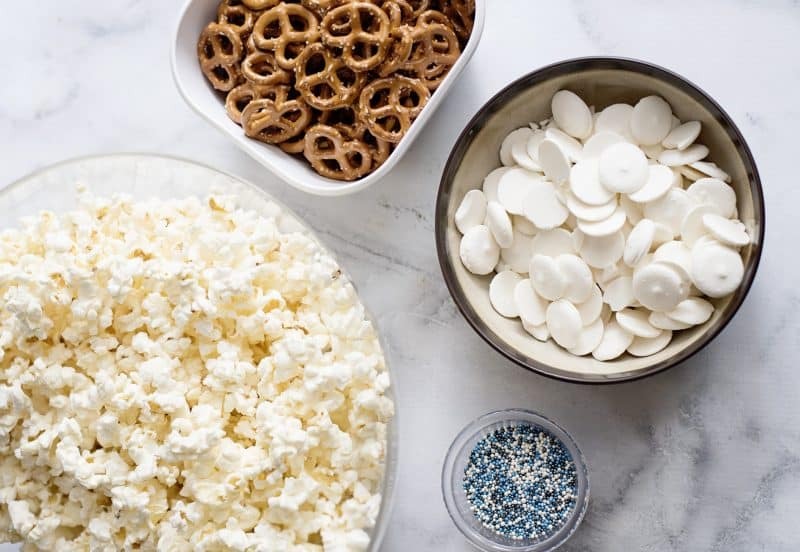 You’ll need: 2 full size bags of no butter microwave popcorn (light butter is okay), 3 cups of pretzels, 12 ounce bag of candy melts (such as Wilton), and some colorful sprinkles. Pop your popcorn according to package directions. Pour that into a large bowl and stir in pretzels. Place candy melts in medium sized microwave safe bowl and microwave at 30 second intervals, stirring after each, until melted and creamy. 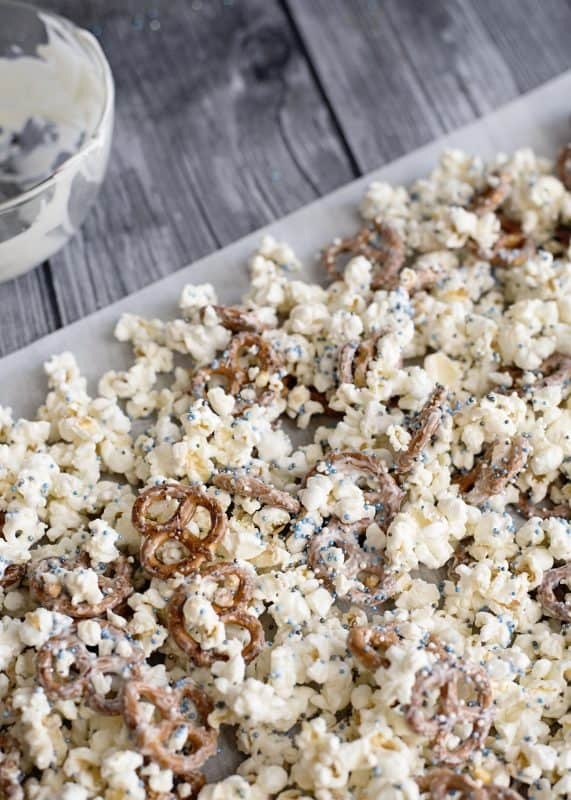 Pour over popcorn, add some sprinkles, and stir to coat. I usually add more sprinkles as I stir as well. Immediately pour it out onto waxed paper and spread it out a bit to allow it to harden. Once it has hardened, break up the large clumps and store it in an airtight container (or plastic bag) until ready to serve. This is also great to put in those little clear party treat bags, tie with pretty curling ribbon at the top, and give out to friends, family, and coworkers. So pretty, so yummy, and so easy! Are you doing anything special this season to slow down and enjoy the things that matter most? I’d love to hear about it in the comments section below. Let’s inspire and encourage one another! Pop popcorn in microwave according to package directions. 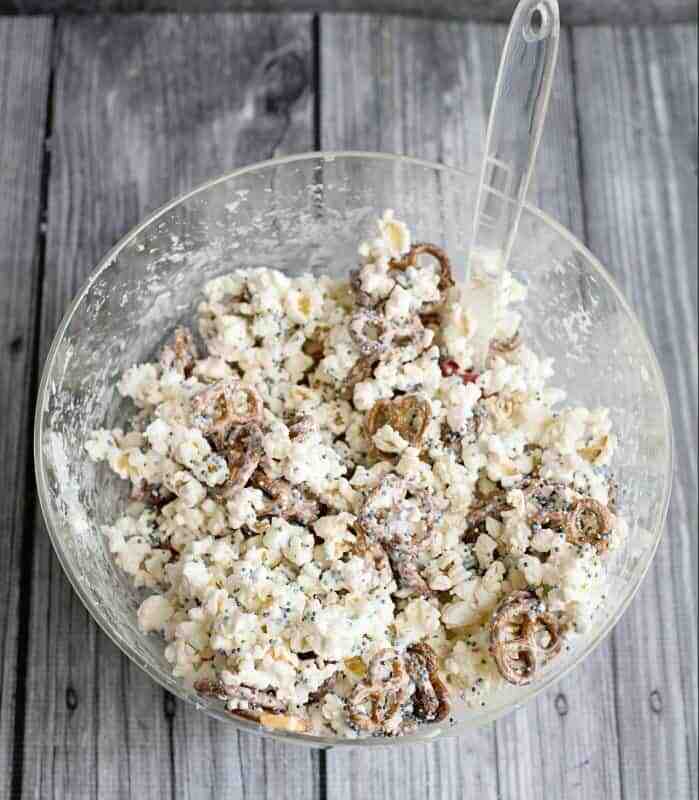 Pour into a large bowl and add pretzels, stir to combine a bit. In microwave safe bowl, place candy melts. Microwave at 30 second intervals, stirring after each, until melted and smooth. 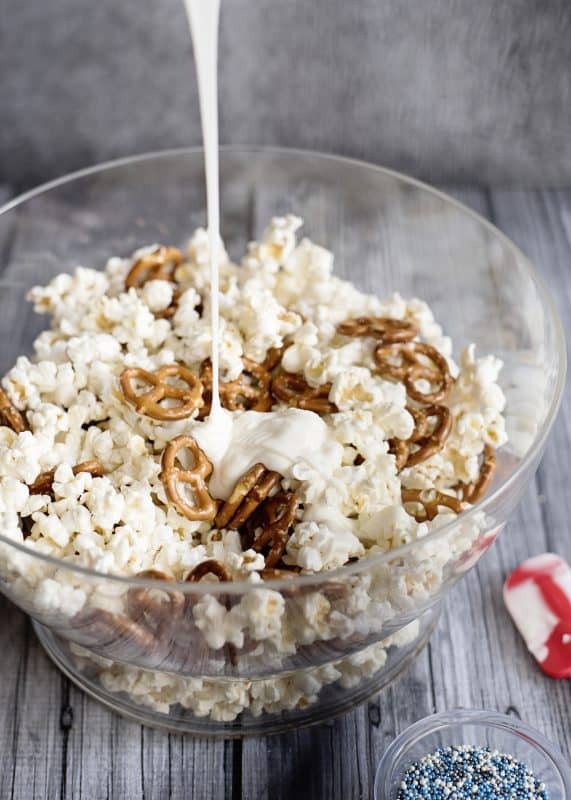 Pour melted chocolate (candy melts) over popcorn and pretzels and quickly stir until well coated. Add sprinkles before the chocolate sets and stir again, sprinkling as you stir if needed to help evenly coat. Pour out onto waxed paper lined baking sheet and allow to Harden. Break up into bite sized pieces and store in airtight container. Time spent with loved ones is time well spent. Love this idea. We don’t have a microwave, so I will melt chocolate the old-fashioned way! 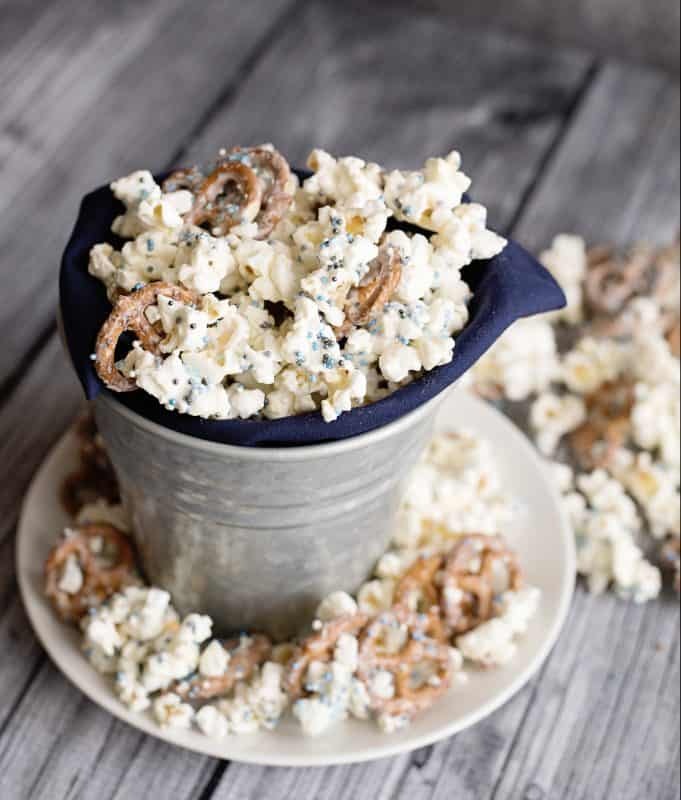 It should work with regular popped corn, too, right? Hubby pops it in a pot the way his daddy taught him. Absolutely! I love the taste of it after it’s popped the old fashioned way best! Can almond bark be used in place of candy melts? I’m using several your recipes for gifts to friends. Thanks for letting us know where to purchase some of the Christmas bags and supplies to make these gifts special. We don’t have a busy time around the Holidays like we used to. Most of our family lives in other states too far away and the ones that are close seem to be busy. However, we have a blessed Christmas and enjoy the ones we can spend time with. That sounds like a wonderful holiday to me, taking it slow, intentional time with the ones that are available, enjoying the blessings as they come 🙂 thank you for being here! This sounds great! Do you think white chocolate chips would work with this? How much popcorn would you use if you’re using regular popcorn. I don’t have a microwave. Thank you. I might try this with my granddaughter. She spends part of her weekend with me while her parents work, and we’re always looking for something to do. Thank you Christy for your joy and passion that you pass on to others This looks like something special to make with the grands. Y’all have fun and make lots of new memories making it!! If stored in containers, how long will this delicious looking treat last? My husband wants me to try this! He says it sounds good!! I think to add a little more to this treat, I will melt some chocolate bark and drizzle over the top!! Thanks for all the ideas! I love your blog and daily emails!!! Can I melt white chocolate chips instead of candy melts?